Across North America’s railroads, intermodal traffic is running strong. Trains maintained a solid pace in hauling containers and trailers well after the autumn peak volume weeks of September and October. Through holiday slowdowns and a series of tough winter storms that have periodically delayed rail traffic as well as interrupted air and roadway travel, intermodal has kept posting levels well above the pace set a year earlier. The continent’s major railroads expanded intermodal container and trailer loadings 14.7 percent in 2010 from 2009, to 14.1 million revenue shipments. Container hauls were up 16.4 percent to 12.3 million units, as more shippers used the efficient double-stack well cars. But in 2010 trains also carried 3.8 percent more trailers with their attached chassis, each on its own flatcar, for 1.8 million shipments. That reverses a long-term trend in which intermodal trailer moves declined while containers gained. And while the past year was expected to show decent intermodal growth from 2009, when the recession bottomed out after the deepest decline in decades, some analysts have been surprised that the weekly and monthly year-over-year gains continued well past the autumn peak. By late 2009, after all, the freight industry was perking up and foreshadowing the capacity crunch that developed last spring. But North American railroads kept posting weekly double-digit increases from the 2009 pace throughout October and November, and in most weeks raw volume remained stronger than during the springtime crunch. December’s storms slowed the weekly gains at times, but intermodal traffic was up a sharp 25 percent in the week that included Christmas. Industry observers say much of the growth is because railroads and intermodal marketers are taking share from all-highway truckload service. “Shippers are using intermodal to save transportation costs and reduce exposure to rising energy costs,” said analyst John Larkin of Stifel Nicolaus, and railroads are improving their service with lane upgrades that speed their intermodal deliveries. However, international shipments make up more than half the intermodal volume through the year, and they also have remained strong. Terminals at the Port of New York and New Jersey loaded 24 percent more containers onto trains in October than a year earlier, and more than at any time since August 2008. For all that, however, intermodal has not recovered all the volume it lost in the recession. 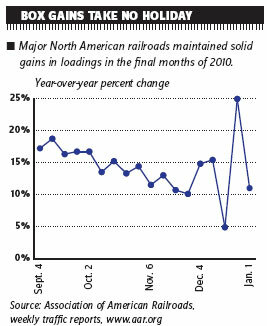 Box volume for major U.S.-owned railroads in 2010 was 1.9 percent behind 2008 and down 7.5 percent from 2007. Still, 2011, like 2010, will be a crunch year for intermodal capacity, market watchers warn. Truckload capacity is likely to be tight again this year, driving more domestic box loads to trains. Meanwhile, ship lines are expected to continue their slow-steaming to help offset rising fuel costs, which slows the cycling time for available containers in the supply chain. Weather may sometimes cloud the picture: With a new winter storm across the Southeast last week, Norfolk Southern Railway warned of up to 48-hour shipment delays. But the pattern in the past year — from last February’s “snowmageddon” to recent major storms in the Midwest and then in the East — has been that intermodal traffic surges once rail service returns to normal. Although shipper demand will keep growing this year to move containers or trailers on trains, volume growth for major intermodal firms will be “be constrained by a general lack of domestic container availability in the market,” Larkin warned clients recently. Kevin Sterling, an analyst with BB&T Capital Markets, notes several large shippers, including clothing retailers, manufacturers and home improvement stores, have said they are increasing their use of intermodal in their transportation mix, partly for the efficiencies and partly to lower the emission levels linked to their shipments. Some intermodal partners such as Hub and Union Pacific Railroad already have started ordering more of the big 53-foot domestic containers that are in heavy demand for intermodal service to compete with trucks. In times when the flow of 40-foot import containers is especially heavy, the 53-footers also are used by transload operators near the seaports that shift ocean cargoes into the larger domestic boxes for the interior trip while the smaller marine containers turn around to quickly head back overseas.